WEST connects the industry professionals who design and build the platforms, equipment and weapons with the designers of communications and technical systems. To complete their missions successfully, more than 150,000 professionals in the U.S. Navy, Marine Corps and Coast Guard who live in the San Diego area depend on the open discussions and valuable networking WEST provides. Senior military and government officials talk directly to the operators to gain valuable feedback directly from them. Industry leaders attend because they can connect with decision makers and operators over the three-day event. When and where does WEST take place? The event takes place February 13-15, 2019, at the San Diego Convention Center in San Diego, California. *All exhibits must be set by 5:00 PM on Tuesday, February 12. After this time, Show Management reserves the right to use any empty space in a way that will complement the overall appearance of the exposition. If you foresee any difficulty in meeting this deadline, please request a variance from Judy Spargo no later than 5:00 PM on Thursday, February 7. Exhibit Hall Hours will be available later in 2018. Check back for more details. When will WEST take place in the future? WEST 2020 will take place March 2-4, 2020 and will be held at the San Diego Convention Center. WEST 2021 will take place February 16-18, 2021 and will be held at the San Diego Convention Center. WEST 2022 will take place February 15-17, 2022 and will be held at the San Diego Convention Center. WEST 2023 will take place February 14-16, 2023 and will be held at the San Diego Convention Center. WEST 2024 will take place February 13-15, 2024 and will be held at the San Diego Convention Center. Are you looking for more information? Please visit the Contact Us page if you have questions regarding general conference information, attending, exhibiting or sponsoring. The WEST 2019 theme is Sharpening the Competitive Edge: Are We Ready to Compete, Deter and Win Globally? How much does it cost to attend WEST? Visit the Categories and Fees page to learn more about WEST 2019 registration rates. Registration for WEST 2019 is officially open! Click Here for Attendee Registration. Click Here to access exhibitor personnel registration through the exhibitor console, using your company password. What additional professional development opportunities are available? WEST’s commitment to professional development includes keynotes, panels and special presentations on the issues affecting today’s Sea Service community. Visit the Continuing Education page to learn more about continuing education opportunities. Where can I find conference approval memos? Approvals will be available later in 2018. Check back to see the exclusive conference approval memos. Can I earn reserve credits for attending WEST? Members of the U.S. Navy, Marine Corps and Coast Guard Reserve have been authorized to earn one point retirement credit for attendance. Reserve and National Guard (Army and Air Force) personnel may participate on a non-pay credit basis with approval of their unit commanders. Bring unit forms to the conference operations office located in the Knowledge Center on the exhibit floor for validation. Housing reservations can be made online. Details can be found on our Location, Dates and Hotel Information page. Badges can be picked up at the registration desk on showsite. All registrants will receive a confirmation notice via email. If you do not receive a confirmation, please contact the WEST Registration Center at (703) 449-6418 or westregistration@spargoinc.com. Attendees pre-registered before February 9th can print their badge at the satellite printing station in the Marriott Marquis Marina hotel. Open Tuesday, February 12 (3:00PM - 7:00PM) and Wednesday, February 13 (6:30AM - 12:30PM) only. Conveniently located in the South tower on lobby level, near the shoe shine station and the Exchange. A limited amount of parking is available on site at the San Diego Convention Center. Additional information about area parking is available online. 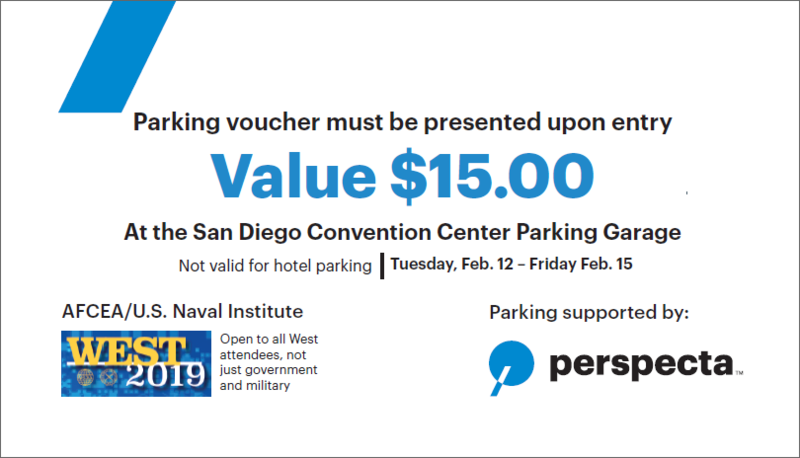 A discount coupon for $15 is available for all attendees, who park in the San Diego Convention Center garage, and will cover the entire parking fee. Click on the coupon to download. Parking Support provided by Perspecta. Attendees are not permitted to photograph, record, or videotape any portion of the WEST conference proceedings. Working members of the press are required to preregister and check in at the press desk at registration to photograph and/or videotape at the show. Exhibit personnel may photograph and/or videotape only their personnel and equipment within the confines of their booth. Failure to comply with this policy will result in confiscation of devices or material and administrative action under applicable government guidelines. Attendees understand that AFCEA, the U.S. 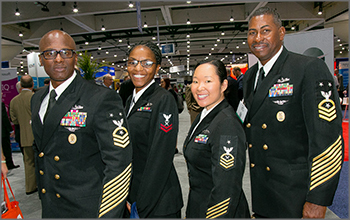 Naval Institute, and their authorized representatives (show management) may conduct interviews and may take photographs and/or videotape in any part of the WEST conference and exhibit hall. These photographs, videos, and recordings are for use by show management in publications or other media material produced for the purposes of conference promotion, including but not limited to: brochures, invitations, books, newspapers, magazines, television and websites. Attendee and exhibitor registration grants show management permission and consent for use of this photography and video. Attendees: For all WEST events, professional business attire is suggested. Military personnel are encouraged to wear the appropriate uniform of the day. Speakers: Active duty military speakers are encouraged to wear khaki uniforms with ribbons (USN), Service B “Bravo” (USMC), or Tropical Blue (USCG). Civilian presenters are encouraged to wear equivalent professional business attire. Who should I contact if I need assistance at the conference? AFCEA and the U.S. Naval Institute support the Americans with Disabilities Act of 1990. Attendees with special needs should call (703) 631-6126 or email events@afcea.org. How can I become a WEST exhibitor? How can I see this year's floorplan? WEST 2019 will be held at the San Diego Convention Center. To view this year's floorplan, click here. Does Event Management or the Event's hosts provide attendee lists to third parties? WEST and SPARGO, Inc. (Event Management) encourages you to be aware of organizations who claim to have access to the WEST Attendee List, as they may try to sell this list to you. Please note neither the conference co-hosts, AFCEA International and the U.S. Naval Institute, nor SPARGO distributes an attendee list or any attendee information and DOES NOT offer list rental services. Like many successful trade shows today, WEST is targeted by unethical businesses that scrape email addresses from websites to contact participants about list rentals, hotels and other sales offers. WEST and SPARGO take data security, your privacy and privacy of the attendees very seriously. Who do I contact to exhibit and sponsor? How can I be a WEST sponsor? Additonal questions about exhibitor resources? Need some help before WEST 2019? Check out our Exhibitor Resources for helpful tips on exhibiting. Conferences present opportunities for America's adversaries to target U.S. government employees, academia, defense industry and other personnel to collect our critical information. Be a hard target! Use good OPSEC practices to protect yourself and your organization's mission. Be aware of your surroundings when discussing sensitive unclassified critical information during the conference and after hours, in common/public areas (e.g. social gatherings, networking mixers, etc.). Be suspicious of strangers. Even though they sound like they belong at the conference, don't assume they are there for the same purpose as you. Use caution when sharing information with someone you don't know. Ask others to confirm a person's identity before sharing critical information about your organization's past, ongoing or future operations/activities/events. Protect your personal information, such as your room number and daily schedule. Don't give out your business cards freely, particularly when outside the United States. Remember, phishing is still the #1 adversary threat vector into your personal and government computers/devices/networks. If you use a laptop or other portable electronic device (personal or government-owned), use it cautiously. Disable the Bluetooth and WLAN/Wi-Fi connections when not in use, and if you use this type of connectivity, understand that you may expose personal and work-related critical information to an adversary. Be especially cautious when using unencrypted/unsecure WLAN/Wi-Fi hotspots. BE SMART! BE SAFE! PRACTICE GOOD OPSEC!